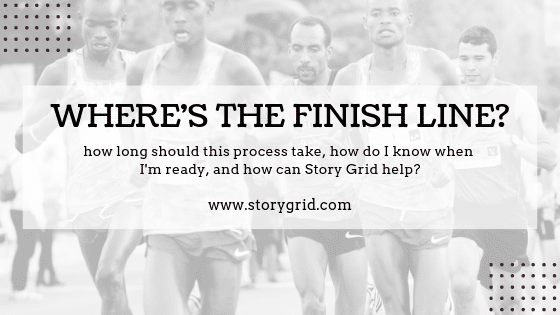 How long should this process take, how do I know when I’m ready, and how can Story Grid help? In today’s Fundamental Fridays article, I’d like to address a question that all novelists have somewhere in the back of their minds: how long “should” it take to write a novel? When do I stop tinkering with my creation and put it out into the world? But then you decide that it needs more tweaking, so you get back to work. Another year passes…. You aren’t happy. You want this book to be read. You, as an author, want to be seen. You’re ready for the next step. So what should you do? You are emotionally ready to be done with your creation, but you can’t let go. We are all afraid that perhaps we are frauds, because we’ve put so much work into something that still isn’t ready. None of us wants to foist upon the world a half-baked idea, or a wordy, confusing tome. What’s more, pretty much all books start out as exactly that, a half-baked idea, or a wordy, confusing tome, so your fear isn’t misplaced. Even if your idea is great, it might not be ready for public scrutiny—that’s entirely possible. As I talk to writers everywhere and also consider my own creative work, this fear seems to lurk menacingly in the background with every conversation, and yet no one wants to ask me out loud, “Exactly how long should I expect to be working on this thing?” Why? Perhaps they are afraid of the answer, or embarrassed to admit that they want to be done with their book as quickly as possible. Perhaps they think I am going to tell them that it took Tolkien something like sixteen years to write The Lord of the Rings, or they’re reminded that they’re still waiting for the next Game of Thrones installment from George R. R. Martin, five years out from his last volume. Some quick math will then show them that at that rate, they might not make it all the way through their planned trilogy before they run out of funds, or time…and then what? Is it worth it? What’s the point? 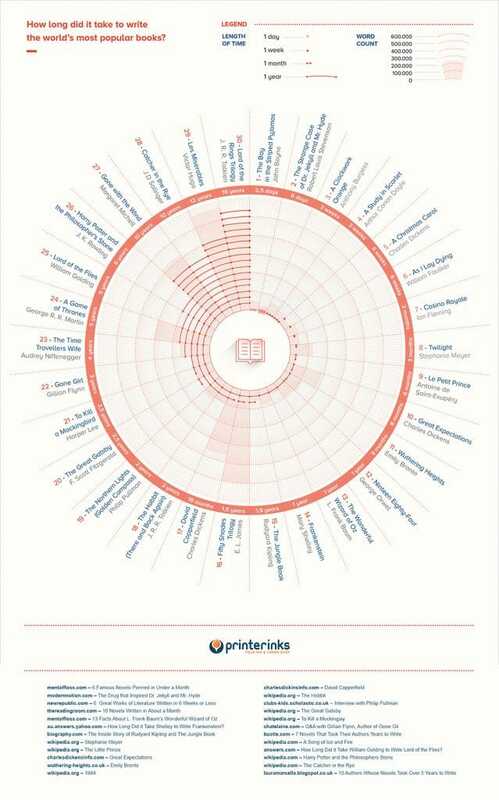 A really fun although potentially horrifying infographic courtesy of www.printerinks.com! I like to tell my clients that if you aren’t trying to write a book that people will read, then you are writing a journal. There’s nothing wrong with that, but then you should consider whether it makes sense to put money, time, and stress into that project. 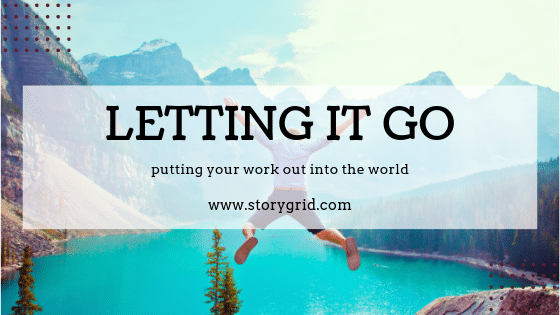 The goal is to share, and in order to share, you need to get your work out into the world. Many of us separate the act of writing from the act of sharing, but it’s really one single continuum. You’re not done with your work when you finish the book. The work is complete when your book is available for others to read. 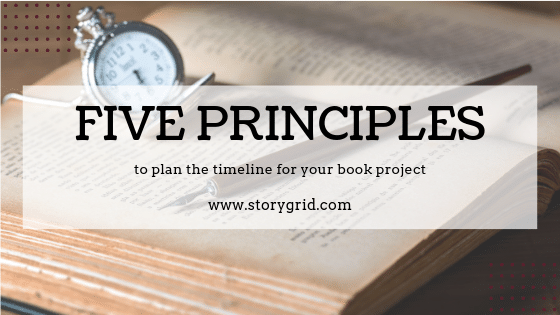 So it’s entirely appropriate to be asking, “How long should this process take?” and “How do I know when I’m ready?” Constructing a realistic but reasonable timeline for your project is responsible and smart. I’d like to present a middle-of-the-road approach to these questions, because obviously, we can’t give precise predictions for art. I recently went through this thought process as I pondered these questions myself. I was editing my own manuscript and wondering when I would be “done.” If I thought about it long enough and hard enough, it seemed I would never be done! And I really wanted to be done. Like anyone, I want to see my books in print, but I also don’t want to make a very public fool of myself. Not only that, but I have more ideas that I want to work on. If I spend years and years on a single book, I won’t get around to all the other things that I want to do. Here are some principles and, I hope, helpful thoughts for my fellow writers on the journey to inhabit the public persona of “author.” If we have a few guidelines, we can figure out a timeline for our project in order to be able to make sound business decisions about our art. How do we assess how long it should take to “finish” what we have started, so that we can put it out into the world? 1. It depends on the book. If you are hoping to write a collection of action-adventure novels of the James Bond variety, you probably can count on taking a shorter time with each book when compared to, say, a memoir or narrative non-fiction project, or historical fiction. Memoirs can be very emotionally charged projects. Narrative non-fiction requires research, as does historical fiction. There will be a lot of time spent not writing, in order to do a good job. If you are writing a “book of the heart,” where it is important to you to say what needs to be said, in the most elegant way possible—it will probably take somewhat more time and focus than a 60,000-word action novel. Can you write a decent memoir in a year, for example? Possibly. Maybe you’re a fast writer, and maybe you’ve been thinking about your book for a very long time. Maybe you’ve been collecting research on that narrative non-fiction project for years. Just because it’s a serious project doesn’t mean that it has to take a decade. That leads us to the next question, length. 2. It depends on the length. Are you writing a novella? A sweet romance of 40,000 words? You can expect to take less time than the fantasy writer with a 500-page manuscript. An epic family saga encompassing five books? That’s going to take a long time. It’s very difficult for writers to be objective about their own work. I think we’ve all had the experience of proofreading until the cows come home, only to realize that we missed the glaring typo on page two. It’s hard to see what’s really there when it’s still so close to you. For this reason, we have to grasp at objectivity when we can. Numbers are a fantastic crutch, because they’re hard to ignore. How long does it take you to write a 2000-word scene? I am a relatively fast writer, but a 2000-word scene would probably take me all day to kick out, even if I were on a roll. And I don’t have many days when I am alone and uninterrupted. Plus, what about those days where try as you might, you can’t even write a single sentence? And those days where you realize the stuff you wrote the day before doesn’t make sense, and you engage the delete key with abandon? If you average those days into your productive totals, it takes longer than one might think to finish a manuscript, even a rough manuscript. Be honest, then see if you can think outside of the box. If the thought of taking several years to complete your 120,000-word fantasy novel upsets you, you can think about cutting it in half or thirds, and completing it one book at a time. This is where the Story Grid method can really help, because you can examine your story arc in smaller pieces, making sure that the smaller movements in your story work. Another good technique for writers where world-building is important, is to consider writing a prologue that consists of the backstory or essential mythology of your world. Is there a religion that figures into your eventual story? Is there a historical basis for the beliefs and actions of your main characters? Think about writing just that backstory and putting that out into the world as a start. And remember that world-building doesn’t only apply to fantasy novels. Any story that involves a world that needs to be explained to your readers—the legal thriller, the political drama, the Depression-era status story—involves careful world-building. If you look at your novel and realize that part of its length is due to necessary world-building, you can shorten the timeline for “finishing” by pulling out some of the world-building and creating a separate project for it. But above all things, be honest. Longer books take a longer time. 3. It depends on your skills. Are you a beginner? Then it will take you longer. And I’m not only talking about spelling and grammar, although you definitely need those building blocks. I’m talking about your ability to tell a story that works. Some people have this gift naturally, but most don’t. Fortunately, you can learn how to tell a good story, and that’s why Shawn Coyne wrote Story Grid. But learning a new skill always takes time. Again, objectivity is the key, and objectivity is hard to come by in the world of creative work. It is usually very difficult for a writer to assess his or her own work. And in order to know how long it will take you to complete your book and whether the work you have done is up to snuff, you will probably have to engage the services of a professional. That leads into my next point, money. 4. It depends on your budget. If you have more money, that’s like saying you have more time. If you don’t have much money, you will need more time. If you have an ample budget, you can engage an editor to walk you through the writing of your book. You can engage an editor to assess the draft you’ve already written. You can even throw up your hands and hire a ghost writer. When you don’t have a big budget, you get up at 4 A.M. and write for an hour or two before you have to get ready for your day job. You squirrel away funds from the day job to hire an editor to save you time by stopping you from wandering off in the wrong direction. When you don’t have a big budget, you skip vacationing with friends and work on your novel instead. More money means you have more time. But this doesn’t necessarily mean that, by definition, people with more money produce books more quickly. People goof off and procrastinate no matter what their economic circumstances. So don’t despair. Look at your reality and understand that you’re in fine company, no matter which life you lead. If you are up at the crack at dawn, working on your book, understand that this is “normal” for writers. We do what we have to do. Adjust the timeline accordingly and consider spending your spare cash on trying to shorten it whenever possible. 5. It depends on your goals. Last, but not least, what are you trying to do with this book? Find an agent and a seven-figure New York publisher deal? Hit it big on Netflix? Memorialize your grandfather’s stories about the old South for your children? Some goals need longer timelines. I have several story ideas that I’ve been thinking about for years that are “big” ideas. I haven’t started any of them, because I want to publish sooner, not later. Accordingly, I am planning to self-publish a couple of romances this fall, because these are books that I could edit and publish relatively quickly. Publishing romances is part of my long-term business plan to learn about the publishing industry and how to market fiction. I don’t want to embark on a major literary project before I know anything about the publishing business. I plan to start work on the “big” books after I’ve published at least half a dozen “smaller” books. I’m also a parent of four kids who are in high school, college, and graduate school, and I’m ridiculously busy. Now isn’t a good time for me to start the epic historical novel set in twelfth-century Japan (yes, I’m serious). I also have no interest in traditional publishing. I’m excited about the self-publishing world and am eager to be publishing my own work through my own small press. I’m not interested in sharing profits with an agent or arguing over audiobook rights with a publisher. Could this change? Maybe. But not anytime soon. But your goals will almost certainly be very different from mine. I have high but realistic expectations for my own productivity because I’m not trying to interest traditional publishers and I don’t have to wait for responses from agents or editors, plus I’m not currently writing anything long or filled with emotional angst. Now that we’ve looked at the various factors that influence how long it might take you to finish your project, let’s consider where you are right now and how to figure out if it’s time for you to let your project go. The creator is a fool, and that’s his/her job. Recently on the Story Grid podcast, host Tim Grahl asked editor Shawn Coyne to talk about the question, “when is the book done?” You know the question is important and the answer is complicated when Shawn and Tim can spend an entire podcast episode on it! In the episode, Shawn reflects on the binary nature of human experience, especially in creative work: what we do as writers is the most important thing in the world, but at the same time, it’s not. We need to create, but we also need to let our creations get out into the world where they can be seen. If we hold on to them in hopes of perfection, we won’t be able to move forward. The work itself is what is important, not the product of the work. Shawn says that as creators, our job actually IS to be the fool. As creators, we SHOULD look like fools as we put our work out into the world, because we’re the ones who dare to do things that no one has done before. Are you afraid of looking like a fool by putting out your work? Then you’re the right person for this job. If you aren’t worried about the consequences of stepping out into the dark, then you might not be doing anything creative after all. I agree with Shawn. Have you written a draft, revised the draft, applied Story Grid to the draft, revised the draft again—and then had friends read it and possibly hired an editor to read it? If you have, and the length of time you’ve spent makes sense according to the principles I’ve laid out above, do it. Pull the trigger. The only way you will learn, grow, and get better is to put your work into public. Tell yourself that you will be even better next time, and the time after that. Allow yourself to be a fool. How can Story Grid help? Here at Story Grid Central, we Story Grid editors offer two main services: the diagnostic, where we read your entire manuscript and analyze it according to Shawn Coyne’s Story Grid rubric, and ongoing developmental editing, where we connect with the writer about once a week as we give Shawn-style advice and encouragement, just as he does with Tim on the podcast, in order to help the writer write or edit and move forward. The various individual editors offer other services, but overall, most of our offerings are based on one form or another of the diagnostic or ongoing developmental editing. Diagnostic analysis of your manuscript starts with an evaluation of your entire manuscript. If you have actually completed at least a first draft of a novel, congratulations! That’s quite a spectacular feat! With a diagnostic edit, we will be able to tell you if your story “works” according to the Story Grid definition, in which we use genre to define reader expectations. Our analysis will help you to see possible missing scenes or conventions, and to map out the overall emotional journey that your reader will have while reading your book. A Story Grid diagnostic helps you with the overall “macro” layout of your story. Developmental editing approaches the novel from a different direction. A Story Grid editor will help you to prepare the overall “map,” but then will help you to get through the actual writing of the scenes. This can take many forms; often, the editor will give you prompts, deadlines, or if necessary, pep talks and encouragement! Everything starts with an understanding of the macro-level construction of the book, but if you need help with the daily grind, our editors are there for you. If you’ve written a first or subsequent draft, our diagnostic will save you time by telling you what is missing and what needs to be strengthened. If you’re stuck, our developmental editing will help you to power through. We understand that what you are doing is hard, and we also know that the writing is not the entire battle. We want to help you to complete your novel by putting it out into the world. Perhaps the thought of all the work that is yet to be done after a diagnostic edit scares you. Perhaps the thought of spending some months in the process of developmental editing with an editor is dismaying. Understand this: it is actually not the work that is scary. No one ever said that being an artist was easy. You always knew that, right? The truth is, heading out from the campfire into the dark is what is scary. That’s not the writing part. It’s the part where you are finished writing, and you are headed into the dark, with your book in your hands, ready to abandon it to the darkness. But it’s the last step before you lay claim to the title, “author.” Lean on us. We are here to help. Everything you need is free on this website. Go ahead. Put your manuscript through its paces. Give yourself a deadline that is reasonable and professional. Then Shawn says to pull the trigger. I agree. Do it. Pull the trigger. Then start the next book. It’ll be even better than the first. Maya Rushing Walker is a novelist and a certified Story Grid editor who works out of her 1700s farmhouse in northern New England. In her past life, she has been a banker and a diplomat, and has lived in a number of far-flung destinations, such as Cairo, Tunisia, and Jerusalem. Visit her website at www.mayarushingwalker.com to see what she's up to in her multicultural adventures in fiction, or her romance novelist pen name site, www.cassandraausten.com. Maya studied international economics at Georgetown University and earned a masters from Harvard, where she studied medieval Japanese history. She has homeschooled four kids, all of whom got athlete genes from somewhere in the family tree, but not from her. Maya, thank you so much for writing this piece for us. I find it encouraging, and meaningful. Of course we must accept that we are the Fools! And I appreciate the reminder that you guys, all of you, are there to help us professionally when the time is right. I study and make notes on all your articles, and finally feel a little less alone with my travails. Thank you for your kind words, Peter! We’re definitely all in this together, and it can feel quite lonely at times. If you sit safely by the campfire, nothing is going to happen, however. We’ve got to put the work out. The work doesn’t end when we have a perfect novel in front of us…we still need to let people read it, and it isn’t going to be perfect no matter how long we tinker with it. I’m also reminded that some of my favorite writers have books that were clearly not ready for publication, but for whatever reason, they did get published. And they survived, and they got better and published more books. Forward motion is key! I’ve been working on my novel for four years. Unfortunately, I did not learn about story structure until after I had spent three years on it… I had to figure it out by feel. By now, at least 20 people have read it. I received the diagnostic about two weeks ago. The conclusion is that it fundamentally works, but there are some structural changes that can really take it to the next level. I’ve decided Story Grid is going to be the final piece of feedback. I’m going to plug it into the grid, revise the structure, tighten up the scenes, then *I* get the last word on the finished product, because I think sometimes in the revisions process I forget that it’s *my* story to tell – and off it goes. How long will this take? A year? I’m hoping I can have it banged out in six months, and then I’ll have a product to actually market. I’ve learned so much throughout the course of writing this book I have to hope I’ll be better equipped to tackle the next book more efficiently. And I will certainly use the diagnostic service again – only earlier in the process. If I’ve learned anything from the course, it’s not to waste time polishing prose before I’ve got the macro nailed down. Wow! My hat’s off to you! And frankly, four years to get to where you are sounds wonderful. If you managed to get to this point on your own, and you have a story that basically works, that’s really an amazing accomplishment. I agree with your plan to just put the final adjustments in place and get it out into the world. You’ve identified a problem with the process that I didn’t touch upon in my article, but it’s very relevant—that as time goes by, and more people read it and offer comments, it becomes difficult to stay focused on OUR story. You’ve got this! And what’s more, I hope you’re excited for the next project, because it is going to be great! Hi Maya, thanks for another great article. You have nailed the adage about “time or money” and put many things in perspective; I know what I need to do now. I have spent eight months furiously writing a novel that’s peaked out at 127,000 words. I now understand I have a great working manuscript but not a finished book. I need to put on my Editing hat and run it through the Story Grid tools, which I expect to do over the next several months before I am ready to tackle “final” revisions. Then I may have something to show to a certified editor. You are right that all the tools I need are on this page. I need to hunker down. Finishing a manuscript is an enormous hurdle. I think most people never get that far. And that’s okay–I tried to arrange a piece of music for jazz band many years ago and never finished that project. I realized I didn’t have the skills, and on top of that, I could see that it was going to take more time than I wanted to spend. And as I said in the article, we can patch the “I don’t have time” problem with money, but then we have to go down a different rabbit trail of figuring out if we can get the money to fix our problem, etc. And I’m completely fine with the fact that I never finished that project. We have to make choices, we can’t do everything. But if you’ve finished a manuscript and you are putting it through Story Grid tools, you are well on your way. There is so much content available to help you on this website, and Shawn and Tim keep putting out more. Good luck! Thank you Maya, for the clarification at the end of this course. It has made a huge difference to my understanding about what to do next. Hello Annamarie! I’m glad! Good luck on your work! We’re all here to help out, so be sure to check back in to let us know how you’re doing! Love this article. Thank you so much for writing it for us.